Agranok, The Dark Titan, has returned! This 8-point Monster brings a new army to lay siege to the Castle, including the Dark Sorceress, Elite Monsters, and a Boom Troll. You'll fight back with the Cavalier, Boiling Oil, and Support Tokens. 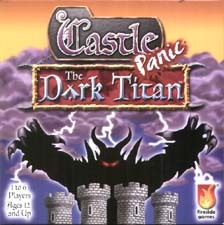 Play with Castle Panic or include The Wizard's Tower, either way The Dark Titan brings more panic!